As it celebrates its 100th anniversary of commercial vehicle manufacturing, MAN Truck & Bus demonstrated its long-standing relationship with the rescue and fire services industry by presenting its lineup of next-generation emergency rescue vehicles at the Interschutz 2015 trade fair in Hanover, Germany. 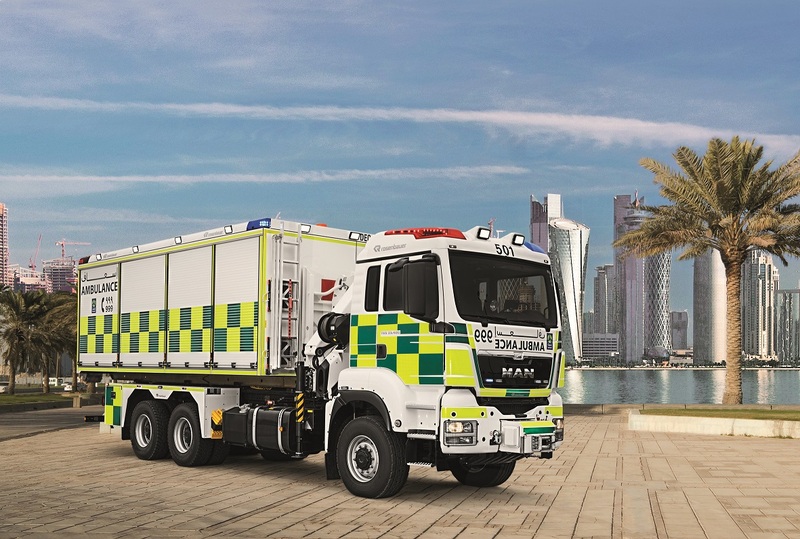 MAN showcased a wide range of rescue vehicles that fall in weight classes of 7.49 to 44 tonnes – including the TGL, TGM and TGS series at this year’s Interschutz, a prominent international trade fair for fire prevention, disaster relief, safety and security. With 100 years of commercial vehicle manufacturing expertise, MAN Truck and Bus has a historic record of engineering the appropriate specification for any municipal or firefighting application. 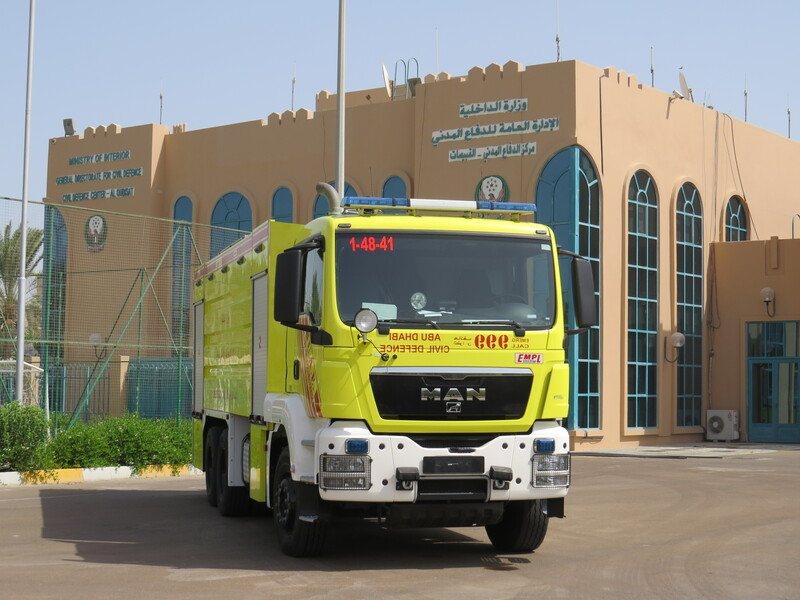 It also has an extensive history with both municipal and civil defense fire services in many countries of the Middle East where its vehicles have earned a well-deserved reputation for meeting and exceeding the most demanding application requirements. In any emergency situation, fire services require vehicles that are reliable, responsive and above all safe in operation. In most applications acceleration and deceleration times, speeds and distances are a stringently specified and tested before the vehicles enter into service. The innovations exhibited by MAN at Interschutz 2015 included many sector-specific features: Integration of Allison automatic gearboxes in the driveline, electronic stability programme (ESP) for rescue vehicles with engageable all-wheel drive and payload optimisation in the TGL series. With its range of wheelbases, frame lengths and cab variants, MAN TGL represents the ideal base for small fire fighting vehicles – such as small water tender fire fighting vehicles, gear trucks, control vehicles or logistic vehicles. The two-axle chassis with on-road drive comes in many different variants in the 7.49- to 12-ton weight class. The four cylinder engines produce 150, 180 or 220 hp with the most powerful engines in the series delivering 250 hp. 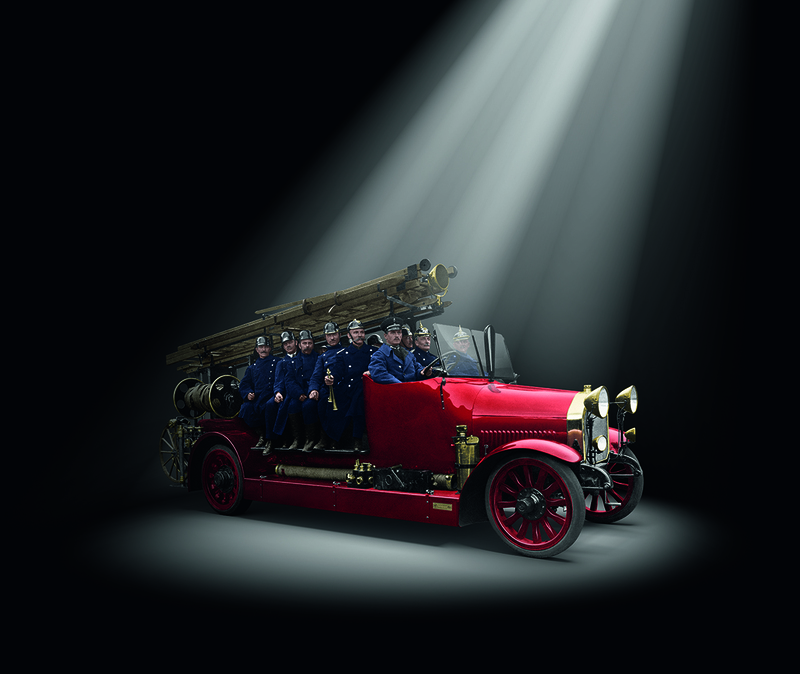 The TGM series – with a weight range of 12 to 18 tons – commands the largest share of the fire service segment. 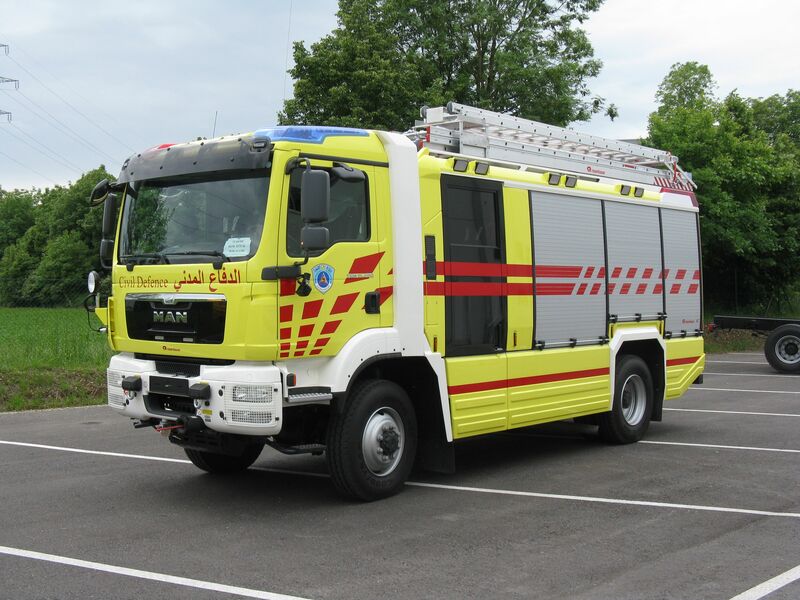 MAN TGM base is used most frequently for various sizes of crew fire fighting trucks, turntable ladders and telescopic masts, gear and recover trucks, hose layers and swap-body vehicles. The series features entry-level engines from 250 hp which can be extended with both the 290 hp and 340 hp performance levels of the six cylinder common-rail engine. The MAN TGS series is designed for heavy-duty loads. Typical uses of the MAN TGS include heavy fire fighting vehicles, large water tender fire fighting vehicles, water tank trucks for industrial facilities and airports, turntable ladders and telescopic masts with a high rescue height, and swap-body trucks. This is made possible by the many different variants in the series with two, three or four axles which can be combined with leading or trailing axles. The performance range of the efficient six-cylinder inline engines extends from 320 hp to 480 hp with interim levels of 360 hp, 400 hp and 440 hp. 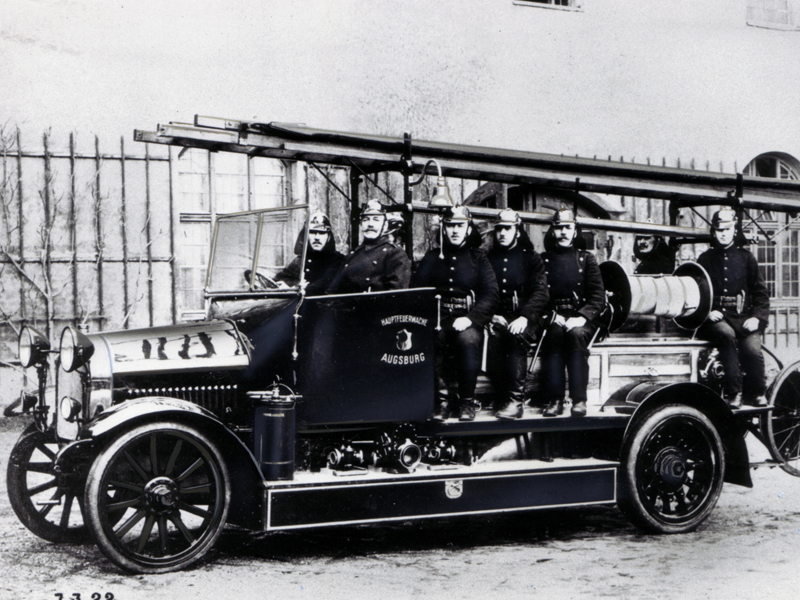 Credited with pioneering and constantly redefining heavy duty vehicle manufacturing, MAN first started manufacturing trucks in collaboration with well-known Swiss carmaker Saurer in 1915, and fire services were among the company’s first customers. Since 2006, MAN Truck & Bus Middle East has been the regional representative of MAN Truck & Bus AG which is headquartered in Munich, Germany and the largest company of MAN Group. It is a leading provider of commercial vehicles and buses that are renowned for their robustness, reliability and adherence to high standards of driver and passenger comfort and safety. MAN Truck & Bus Middle East operates through an extensive network of private capital dealers and importers in 14 countries namely Afghanistan, Bahrain, Iran, Iraq, Jordan, Kuwait, Lebanon, Oman, Pakistan, Qatar, Saudi Arabia, Syria, United Arab Emirates and Yemen. The local coordination office is located in the UAE, Dubai Airport Free Zone and guarantees for efficient sales and after sales support in the Middle Eastern region. Accommodating for the demanding operating conditions in the Middle East, MAN Truck & Bus Middle East provides full-fledged turn-key solutions for both goods and passenger transportation by road through its light (TGL) , medium (TGM) and heavy-duty (TGS WW) ranges of trucks, and MAN and NEOPLAN buses and coaches that provide basic to VIP luxury transport and travel requirements.